Generate more Grip than the competition! The Gripper Limited Slip Differential uses a multi-plate design which, when it detects a difference in wheels speed across the driven axle, locks the driveshafts together increasing traction. This increase in traction equates to faster launches off the line and increased corner exit speeds as the wheels are no longer spinning as they would with an open diffential. Torque is equalised across the driven wheels sending drive torque to both whereas an open diff would send the torque to the spinning wheel wasting drive in tyre smoke! Understeer and oversteer characteristics are reduced and your car is faster all round as a result, all from this one modification. A common argument against a plate diff fitted into a road car was that they were too noisy and too aggressive in action. Not so with a Gripper diff. Using the correct ramp angles, pre-load and plates, when your Gripper diff is set up for road use, you can expect a smooth progressive action that will not upset the balance of the car mid bend and will be almost silent in operation. You will enjoy more grip and traction for a more controlled, better handling and faster car. More so than the equivalent car using an open, geared or viscous diff! A Gripper road diff is generally set up with 40/65 ramp block for more lock in acceleration than deceleration to give a smooth locking action on acceleration out of a corner for increased traction and cornering speed, with less locking action under braking to eliminate the chance of understeer coming into a corner. Preload of 50NM is common across the road diff range to ensure the diff is active only when required and when the diff is set with less active plates (50% is normal on the road range) the locking action on acceleration is smooth, progressive and controlled without unwanted torque-steer. The plates themselves have minute oil grooves machined into them which allows a thin layer of oil to be pumped between them which improves the plates ability to lock and unlock smoothly and reduces plate noise. This also means the plates have a very long service life compared with other plated designs making a Gripper differential almost a fit and forget solution. For your peace of mind, all Gripper Diffs are covered by a lifetime warranty against poor workmanship and inferior materials. Gripper Diffs are made of aero quality steel and are built to tight tolerances which make them one of the most reliable and sought after transmission products on the market. Available with & without fitting, other specs available on request. The Pumaspeed Workshop team are ready to fit the Ford Fiesta ST180 Gripper LSD in our Head Office located here. Therefore making parts and labour a total cost £1,373.99 (inc. VAT). 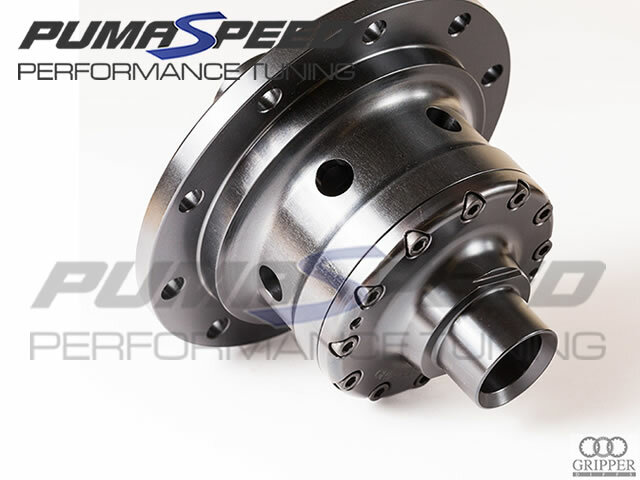 Pumaspeed have a specialist distribution team that can dispatch the Ford Fiesta ST180 Gripper LSD to any destination worldwide.